Joyce Fournier is an internationally collected Painter and Sculptor who lives and works in Toronto, Canada. 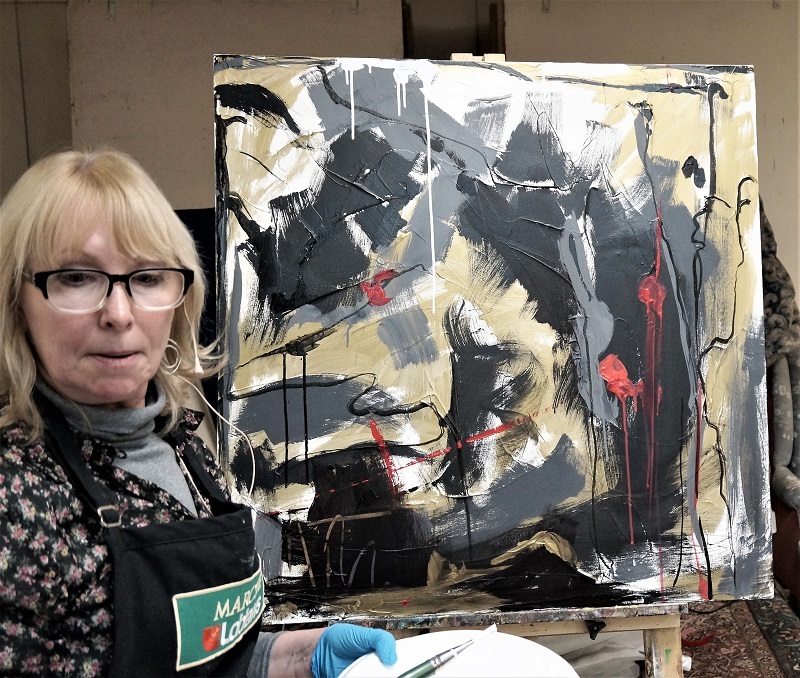 Her new and latest body of work is inspired by a long time fascination with Abstract Expressionism (particularly the works of Franz Kline) and the freedom she experiences when painting from within. 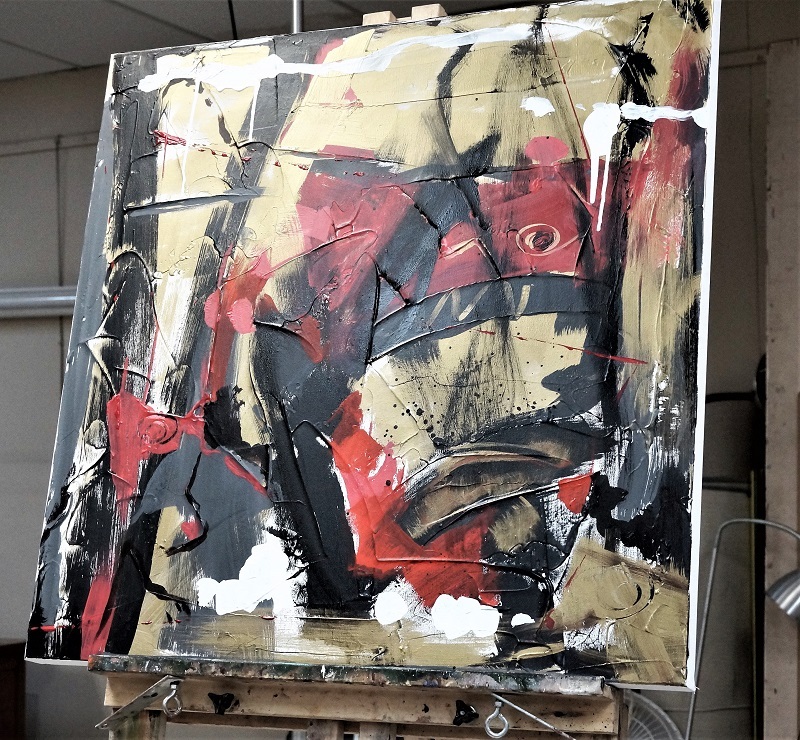 The paintings are gestural in nature, emoting a spontaneity and freedom. As a former student of the Academy of Realist Art, Joyce started her fine art career painting landscapes and portraiture in oil, charcoal and graphite. However, she explained that she became bored with the process and mediums and started to experiment with abstract expressionism. 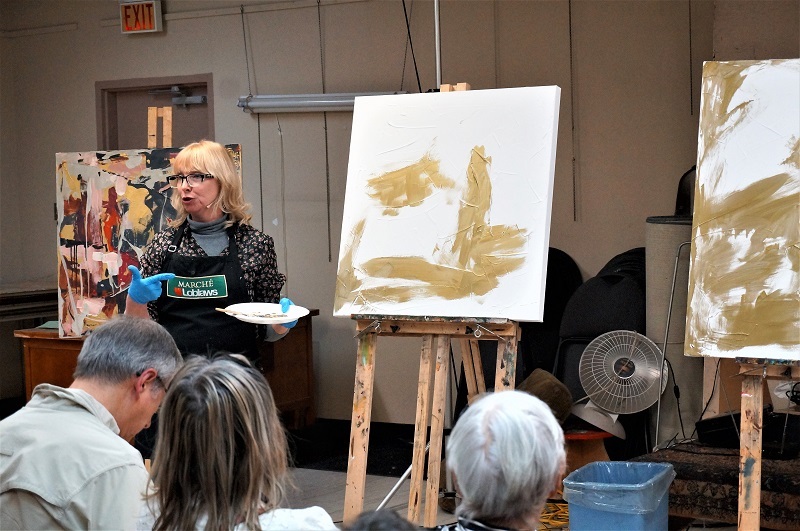 On this evening, Joyce demonstrated her process, which is basically spontaneous application of acrylic paint and medium on a canvas. She stressed that the most important bit of advice she can give is to not overthink anything. Do not plan. Spontaneity is key! 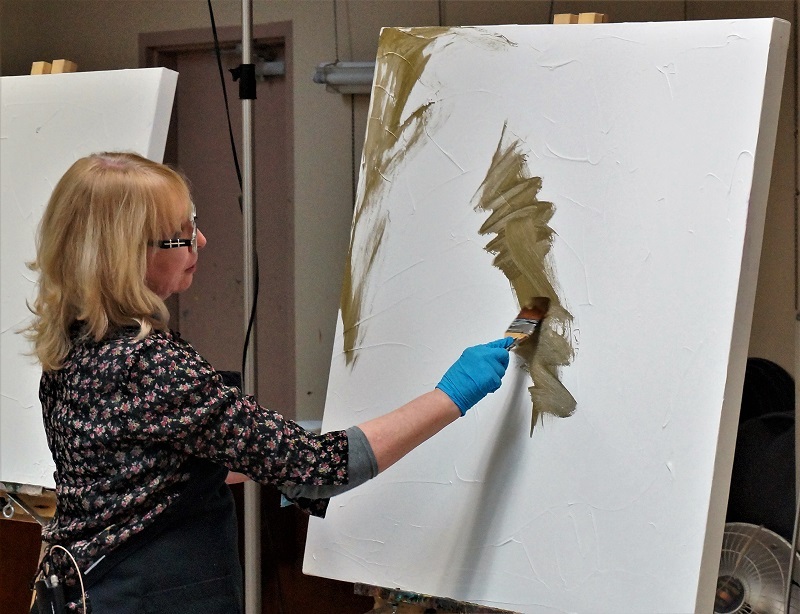 Starting with a fresh canvas, she applies heavy gesso with a trowel, being sure to create plenty of texture. Once dry, the fun begins. 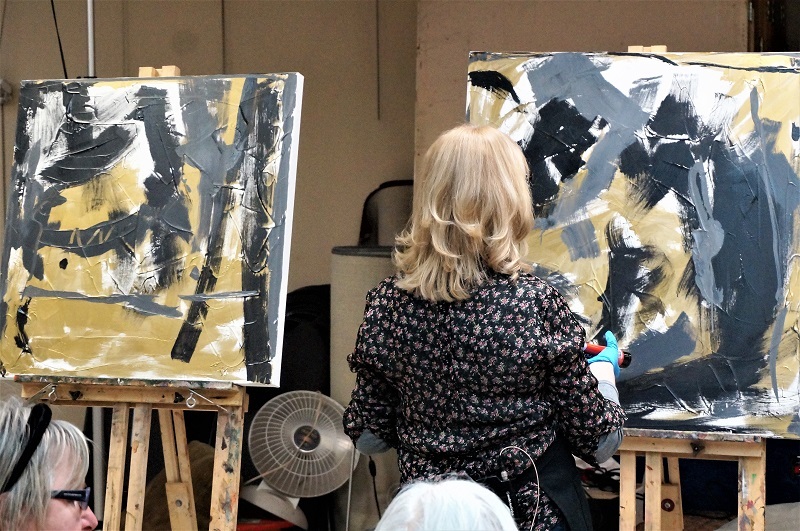 Joyce admitted that most galleries do not care for the colour gold in paintings, however, she usually includes gold, particularly as part of her under painting process. She also likes to use white, black and often, red. 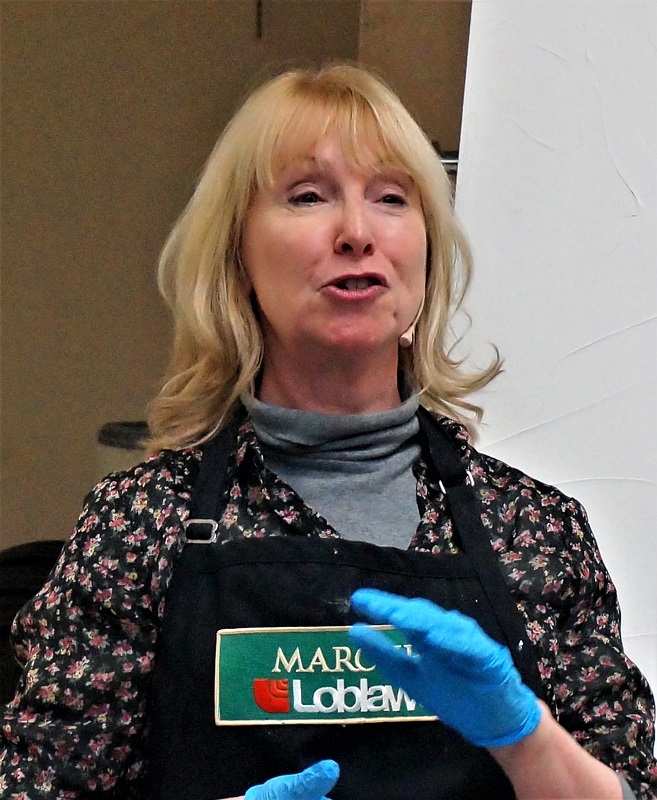 Her choice of brushes are not specific although she recommends using larger brushes, particularly when using a large canvas and painting trowels/knives for making lines and marks. Drips are a favourite in contrasting, bold colour as are lines using various instruments like paint pushers and silicone colour scrapers and trowels. Joyce has made a drastic leap in art genres and it appears she is enjoying herself completely.